I do admit that I love PopTarts. But, I never buy them. And my kids don't eat them. I don't want them to form the association of comfort food that I did growing up. Related – my Sunday coupon insert featured Hershey syrup and the ad was "Reward. Refresh. Refuel. Research suggests delicious chocolate milk has an ideal combination of carbohydrates, protein, and nutrients – including calcium and vitamin D- for a post-work-out recovery". The images surrounding the text are of a kid in a karate uniform, a baseball helmet, holding a basketball. Seriously? They're marketing Hershey syrup as a "post workout recovery food" for kids? The ad does cite a study – funded by the dairy industry and didn't compare regular milk to chocolate milk, but rather compared chocolate milk to Gatorade. I think it's in poor taste to present certain substances in such a manner and to imply that food companies are deliberately adding poison to our food. We can debate whether or not these additives and preservatives are healthy, but saying that these substances are also used in household detergents and varnish implies that they are not safe and don't belong in food. Thickening agents and preservatives can be safely used in the food we eat as well as many other types of products. "Does anyone just eat one pop-tart when they open the package?" Yup, I do! When I was pregnant I craved them (probably because we can't get them easily in the EU) so my husband would buy the incredibly expensive imported boxes and we'd split a package after work. "Among its tasty ingredients?…sodium pyrophosphate, commonly used in household detergents; and Tert-Butylhydroquinone (THBQ), a preservative, also found in household varnishes"
This statement means absolutely nothing. Household detergents and varnishes also contain things like WATER. Do you not drink water because it's used in cleaning supplies? Just because something inedible contains a certain ingredient, doesn't make that ingredient inedible. I also agree with the anonymous post that one adult should not forbid another from doing something like buying Poptarts. Mrs. Q's comment that that person must not be married is patronizing. I'm married and would NEVER try to forbid my husband from doing something. I wouldn't even joke about it because that's not how mature adults and partners behave. Jessica and Woodridge: I quoted Anna Lappe. That's what she wrote. Feel free to disagree with her. All I did was quote her. The quote was what made me think twice. 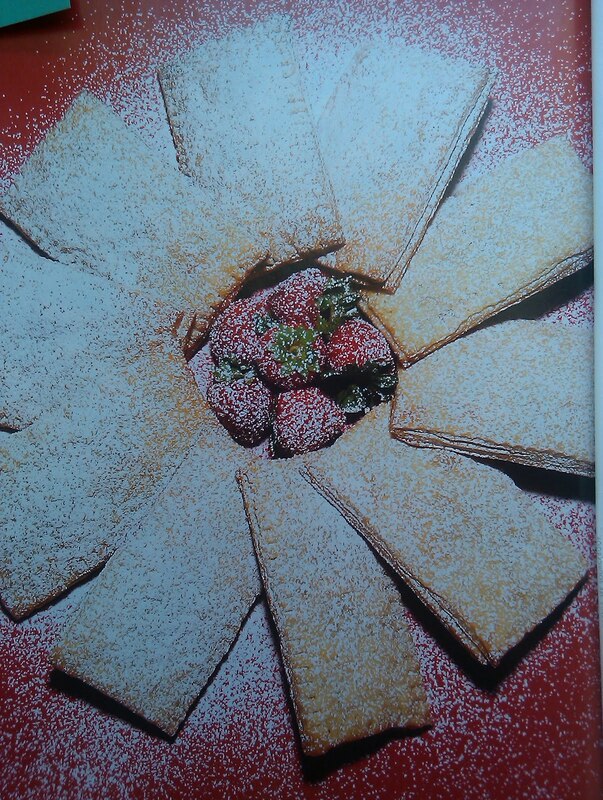 Saw a recipe in a Swedish cooking magazine not too long ago where a little side note said "This sugary pastry is considered breakfast food in the US, isn't that funny?" I just wish that people would use science and not scare tactics to show when discussing food. People should also realize that there is a difference between something that perhaps isn't nutritious but can be "enjoyed in moderation" and something that is actually harmful. Some of us actually do believe that those things aren't safe and don't belong in food. Some of us don't entirely trust the FDA's GRS list. There's a reason why, for example, tartrazine – Yellow #5 has been BANNED in many countries. I'm married and sometimes tell my husband he can't do things (and vice versa). Not in a dictator way, but in a bantering, gentle teasing with perhaps a grain of truth behind it way. Our son has food issues and can't have food colorings, MSG, or petroleum based lard substitutes (yes, that's TBHQ among others) so yeah, sometimes he will call me to find out if he can buy something. That's not because I'm a tyrant, but because foods my son can eat are my area of expertise and he defers to my knowledge. Nothing wrong with that. My feelings in regard to poptarts are mixed. I never had them much as a child, my mother wouldn't buy them because of the sugar content. She didnt want me eating that before school. Same goes with those Pillbery toaster strusals. I probably only had one or two boxes of those PBS (get it!?) during the school year. Which is why when I think of those things, I have a warm fuzzy childhoodlike feeling. It was special to have! I can name maybe two vacations my family took that included buying a box of poptarts and that says TONS as we have been on at least 30 or more and I dont mean weekend trips. But when I also think to poptarts, I have to remember that the only part I loved as a 6 yr old girl was the middle, not that crust part. That statement itself speaks enough, kids like sugar. I won't lie, I love sugar. But at 14 my mother and I made a choice – we would put good, clean, wholesome food into our bodies for nourishment. I could have finally had as many boxes of poptarts, pastries, or whatever my heart desired if I truely wanted but I wanted health! For me that decision helped me LOADS as I was suffering with fibromyalgia. After we made the switch and weened of my meds I had no pain anymore. Its not like I was eating junk before, but the choice to go organic made a big difference. Back to poptarts. I go to a local University where I live. Its junk food galore. If you live in a dorm, you may as well be the "dumping ground" because its nearly impossible to eat good. I'm sure it can be done, but only if you care enough to try. Poptarts specifically are sold everywhere from the vending machiene, bookstore, convenience store (I know, right? ), cafeteria, etc. They are everywhere to be sold and in everyone's hands. I routienely see kids eating them in class as a snack or as breakfast. They do sell tacos on campus in the morning and pre-packaged salads/sandwiches. Yet many people still take the convenient prepackaged route. I would never do that. Bottom line – teach your kids. Educate them about food and do it together. I don't have any children, but I do know I wouldn't allow their growing bodies this crap. We eat for fuel and sometimes enjoyment, but its nourishment that is important to power us through the day. How far will you get on one sugary poptart? PS This should go without saying, I don't eat poptarts. I do however, buy a box of the organic kind for an after dinner snack that lasts me months. I think in my previous comment, it sounded like I was saying "shame on the companies" for marketing the crap to kids. That actually wasn't my point… I don't fundamentally have a problem with marketing. If you make junk, you have to market junk to sell it. But market it as what it is and don't try to pretend it's something else (like pie for breakfast or burritos as a snack before dinner). So very many companies have lost any sense of moral responsibility to their customers that they ever had. Instead of developing and marketing healthy products because, "it's the right thing to do," or because it's a product people want and need, they simply find new ways to make their old products appear healthier or better–to the point of lying about it outright or focusing intently on one good quality of their product so you'll ignore the 30 bad ones. Many of the ads on TV today are borderline offenders of "truth in advertising," IMHO. Why is this okay for food but not okay for cigarettes? – Fruit Loops and Apple Jacks are now being marketed as "high in fiber" so adults will think they're healthier. Nobody said anything about removing all the sugar and food coloring. 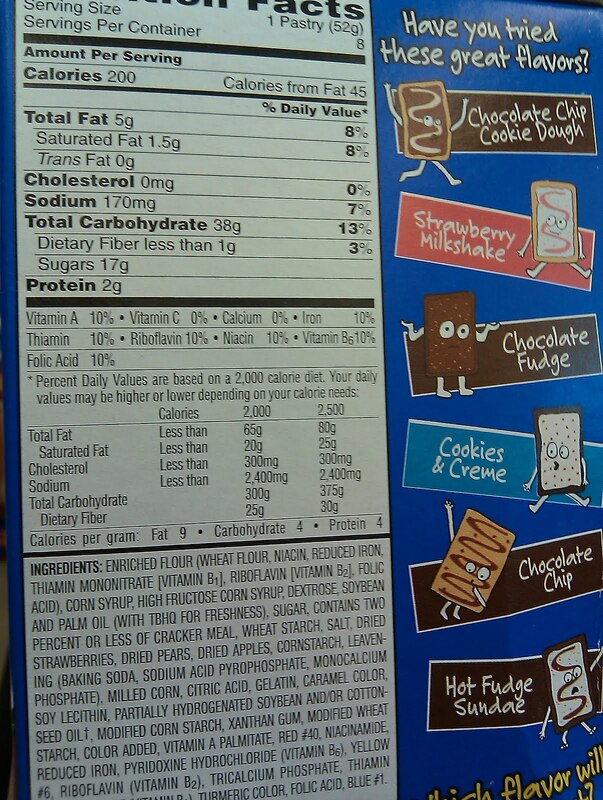 – General Mills and a couple other cereal companies created their own "healthy choice" labeling program that puts a special logo on boxes of their products that are "better choices" (similar to several USDA labeling programs). Unfortunately, the program is run by the industry itself and the standards were written so that just about any box of cereal qualifies. As a parent, would you question the logo? Many wouldn't and the manufacturers know that. – Cheerios have been marketed for the last few years as something that can lower your cholesterol (because of oat/fiber content). First, they probably don't have enough fiber in them to make a difference–especially at the recommended serving size. Second, they're still pretty much empty carb calories served with milk–which HAS cholesterol in it (nullifying the original claim). – The "Subway Diet" …need I say more? Granted, Subway has probably done more than any other fast food chain to promote making better choices and make those choices available, but calling it a "diet" is going way to far, IMHO. I vaguely recall Kellogs trying the same stunt with Special K.
– Yogurt and Yogurt "Drinks" – Read the back of any single-serving flavored yogurt container and I'd bet the nutritional value ranks right up there with an equal portion of ice cream. – Back to the $12.99 plates of food with guaranteed leftovers. Not EVERYONE has the consciousness or will power to know when to stop eating and take the rest home. I certainly don't and that's why I often find myself leaving a restaurant having cleaned my plate and feeling stuffed to the gills. If these restaurants would offer smaller portion sizes at cheaper prices (like they do on the Senior and lunch menus), people would probably visit more frequently and be more likely to order other things on the menu like appetizers and beverages. – The problem even exists in your kitchen cupboard. Next time you're at Grandma's house, check-out the serving platter that goes with her china set. I'd be willing to bet it's roughly the same size as your modern everyday dinner plates. When you put food on a plate, you're psychologically going to make sure the plate looks full. It's really that simple. 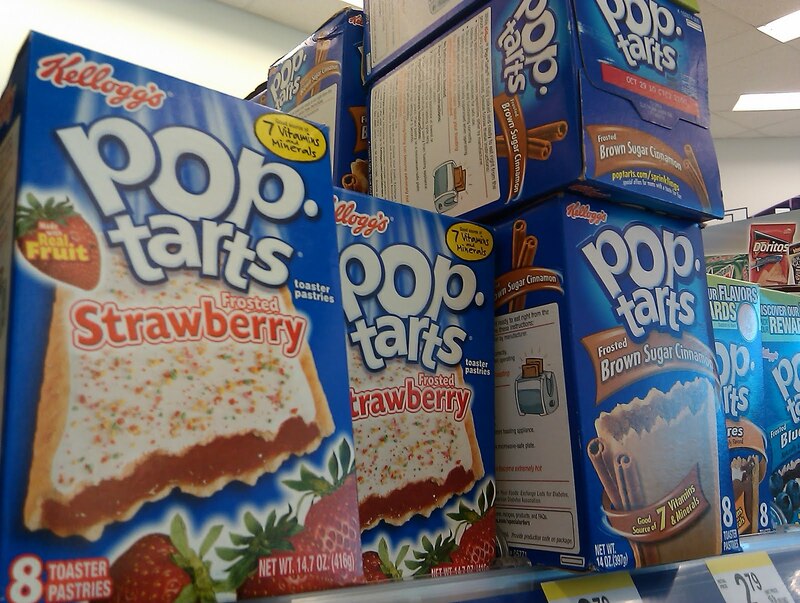 Sorry guys – gotta say reading this post about pop tarts made me want a poptart haha. I never buy them – once in a while I will stash a box in my desk for the rare occasion that I'm starving and broke or that I need sugar. i went and got a poptart from my friend here at work just now and it was a delicious treat. that being said – it was a treat – i had dannon lit and fit yogurt for breafkast with some low cal almond granola and a banana and bottle of water. Pretty good if you ask me. Poptarts aren't the devil. People just need to teach their kids what is healthy and good for them, and if they want a pop tart its a rare treat. Personally i htink eating something for breakfast is better than nothing because it kickstarts your metabolism for the day. If a poptart is all u have great – cuz otherwise you could end up piling on teh calories and junk at lunch because you were starving. When I saw pop-tarts first and kids eating them for breakfast in the US, I felt I came to Gingerbread house in the Hensel and Gretel World. Those are vividly colorful but with malice. I have been reading this blog for a long time, and I have found that I vastly prefer your articles on how to fix the food problems in our country over those that point out the problems themselves. Somehow the voice of your writing in these pieces always comes off as a little bit holier-than-thou, which I suspect is not your intention at all. The vast majority of your blogs are informative and wonderfully written. The love you have for the children in your care is very apparent. We should all be fortunate enough to have teachers for our children who care as much as you do. However, saying that it is irresponsible for a company to choose to market their product in an over the top way such as Pop-Tarts World, speaks to a common confusion we have in this country about corporate responsibility. A corporation's responsibility is to provide a safe product and profits for their shareholders. As consumers it is up to us to decide what is and is not appropriate for our own consumption (and that of others in our care). A non-profit that seeks to teach anyone who wants to know how easy (and cheap) it can be to make great food with fresh, real ingredients is a great idea. I just don't see that it is Kellogg's "responsibility" to provide this service. I agree with many of the comments here that Pop Tarts themselves would be more honestly marketed as a dessert treat then a breakfast food. (My husband enjoys them as such, and I have been known to split one Pop Tart with my 3 year old from time to time as a sweet treat.) I wish we had more room in our Education budget to teach children classes in Media Studies, including advertising. Showing a child how marketing works and pointing out how it can be misleading probably does more in the long run for them then merely sheltering them from ads once they are old enough to read and interact with the world outside the view of their parents. But of course, that is just a personal opinion. I find it amusing that after pointing to a lack of journalistic integrity in the news report from Yahoo, you brushed off the comments on the misleading information in the Anna Lappe quote by just stating that it was a quote. Perhaps in the future a little fact checking would be a good idea. Tetrasodiuum pyrophospate is found in many products including canned tuna and toothpaste. (http://en.wikipedia.org/wiki/Tetrasodium_pyrophosphate) Are we to assume that Anna Lappe is boycotting these as well? Being a blogger isn't exactly equivalent to being a reporter, but I think we all benefit when things listed as facts, are backed up with sources and include all of the applicable information. What we do (or do not) feed our families is a very personal issue. While discussing these issues I think it's important that we not put down others decisions and instead include everyone in the discussion. 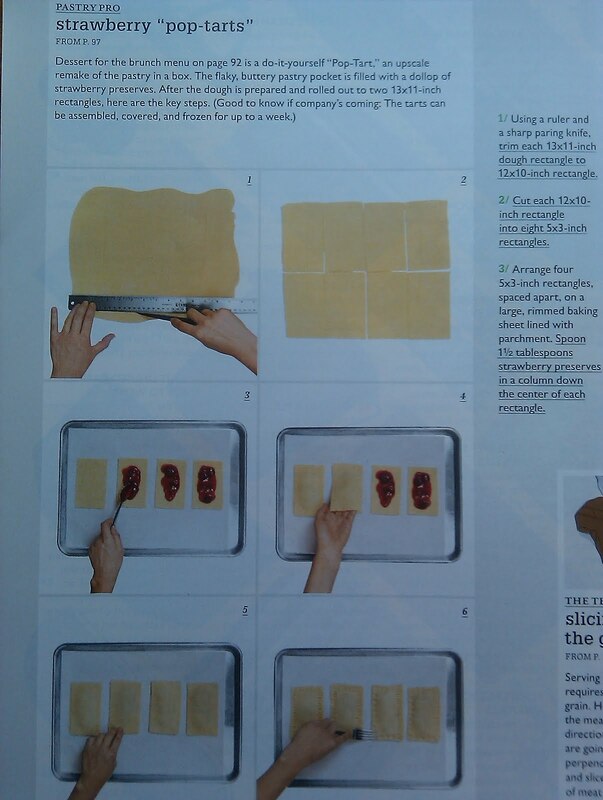 I think the inclusion of the recipe for homemade pastries was a good step in the right direction. Instead of just saying no, you said, "Why don't you try this instead"
i agree that for kids whose parents can't afford breakfast, poptarts are better than nothing. if the kids aren't getting good breakfasts at home it's up to the school to give them SOMETHING. and ANYTHING is better than going to school with an empty tummy and waiting until lunch to eat. i really feel for those kids. LOL, This post has turned so funny to me. Banter is one of the fun ingredients in my marriage. We have fun with each other and bond through banter. If we weren't able to laugh at each other and at ourselves, what boring people we would be. I had a bad experience at a convenience store and told my husband that he wasn't to go there anymore. That is not a dictatorship. That is, "They did me wrong and as my husband you should stand by me and support my decision not to give them anymore of our money." And if he felt strongly about something, I would do the same for him. That is being real partners. Mature partners. He is my best friend. And if either of us say 'don't do . . . .' then the other has enough respect to know it must be something we feel strongly about. That's a healthy marriage. I am really trying not to sound "holier than thou" as I have received that particular criticism a lot. In real life I'm incredibly nice and friendly and much of what I say on this blog I wouldn't say to the average person on the street (but I do say to my family and in circles of friends). Let's just put it this way: when I have to be, I can be a b*tch. I wonder if that personality trait is the one that started this whole project and, if so, I'm happy that I have a strong heart, a critical mind, and a mouth. I am doing my best to be respectful to everyone. 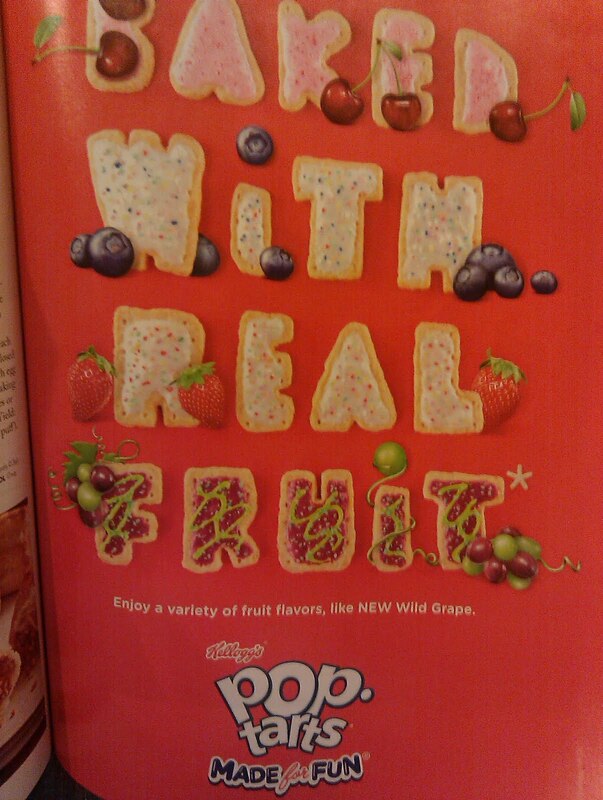 Pop Tarts may be a distant relative of fruit, but they are not fruit. Marketing them as healthy and connecting them to real food is dishonest. They are junk food, a "treat", dessert, not a meal. Up until this year, just tasting jelly would trigger my gag reflex. So, growing up, pop tarts, pies, or jelly donuts were absolutely off my list. I still don't enjoy it much, but at least I can handle it now. At least, the imported European or local organic (read: not over sugared) varieties. It's funny now they advertise 'Baked with real fruit.' This is like when McDonald's announced their chicken nuggets will be made with white meat going forward…I thought um, what was it before!? I mean, don't get me wrong this is an improvement, but if I wanted my kids to eat things with real fruit, I would give them a real fruit. "Eat all the junk food you want, as long as you make it yourself." The premise is that some things are so much work (ie the home made pop tarts) that you'll probably consume them FAR less than you would if you just buy a box. So they aren't necessarily better for you, but the fact that they aren't convenient really cuts into the amount you consume. Back to the kids at school thing: I work with kids. Bread with peanut butter, a hardboiled egg, and fruit is FAR better (and cheap) for a child to be eating than something full of sugar like a poptart. The poptart wouldn't fill them up and they are not any better off-because by recess they are still hungry crashing. I have fed some of these kids myself. Marketing is just that-marketing. I think it's up to parents to provide their kids with the critical thinking skills. It reminds me of when my son was young and my aunt offered him a fruit roll up. He declined and asked for an apple. She became upset and demanded that it was really fruit. Jake looked at her and said, "Auntie, it's a sugar roll up. Just read the ingredients." Along with what many people have stated above, I feel the biggest problem is in the marketing. I'm a college student who eats Pop-tarts on occasion. I love the taste (shocking, I know), it's convenient when I'm in a hurry…but it's not a habitual thing. I do think, particularly in advertising that targets children, that they should be marketed as a dessert rather than a breakfast. A lot of adults know about things like marketing and false advertising. Most children don't, so if they see something portrayed as an appropriate breakfast choice, they'll be less likely to question it, especially if no one has taught them critical thinking skills. Education is key. Scattered Mom: the story about your son is funny! Just goes to show how capable children are of making good decisions if they're provided with the right tools! Another anecdote: I talked to a returning soldier from Iraq recently. He was telling me that one of the MRE (meals ready to eat) that they receive over there is a package of Pop Tarts. He said that at least where he was, they were the best MREs that you could get, and people got very territorial about their tarts. I never really understood pop tarts, but I also want to clarify something that I've heard come up a lot here. The calorie content is not really the issue- it is completely reasonable to have 400 calories for a meal, even elementary aged children, and I think that breakfast should be one of those meals where you might have even more. It is the content of those calories that is the problem- quick energy derived from corn syrup and white sugar, rather than fats and proteins that provide you with energy slowly and steadily (I know I'm simplifying the science here, feel free to expand or correct me). Personally I'm finding that if I start out breakfast with two eggs, a piece of toast, sauteed kale or collards or some other green (sometimes with tomatoes too), some vegetarian sausage or a big slice of cheese, and a banana, I snack much less during the day, and eat smaller lunches and dinners. I'd say that breakfast is probably in the range of about 600-900 calories, but throughout the day I definitely tend to think about food less and eat less of it. If I just have a bowl of cereal for breakfast, which used to be my standard, I find that I start grazing around ten, and never really stop for the whole day. What the heck is this world coming too!!! I wish all you carb counting food puritan's would go fly a kite. If you don't like them fine… Don't eat them. But for God's sake leave the people and kids who do alone!!! completely agreed with anonymous 7:24 am. i was wanting to say this many times. ps- s'mores ones are the best! instead of fighting about whether they're good 4 u or not let's fight over the best flavors. this blog would be so much more fun! Mrs. Q, some readers point out that your vehement reactions to things like McDonald's and Pop-Tarts are off-putting. It occurred to me to ask you, since you have mentioned that you're newer to healthier eating and cooking, if perhaps your reactions are the strong reaction we sometimes have to learning a new and better way. (Ever have a friend who's converted to a different religion, for instance, and is now vocally and strongly opposed to her/his past life? That's what I mean.) I say this not to discourage you from speaking out, but merely to toss it out there for your own thought. This is your blog; please continue to speak out as you like! And on corporations who produce this junk food: the reader who said that their responsibility is to be profitable and to reward their shareholders is right on. Have none of you ever examined the mission and vision statements of large companies? Betcha this idea is in most of them. Ethically and socially, they may have some sort of responsibility not to market to children, but, well, ethics and profitability really don't go hand-in-hand when the rubber meets the road with some companies. 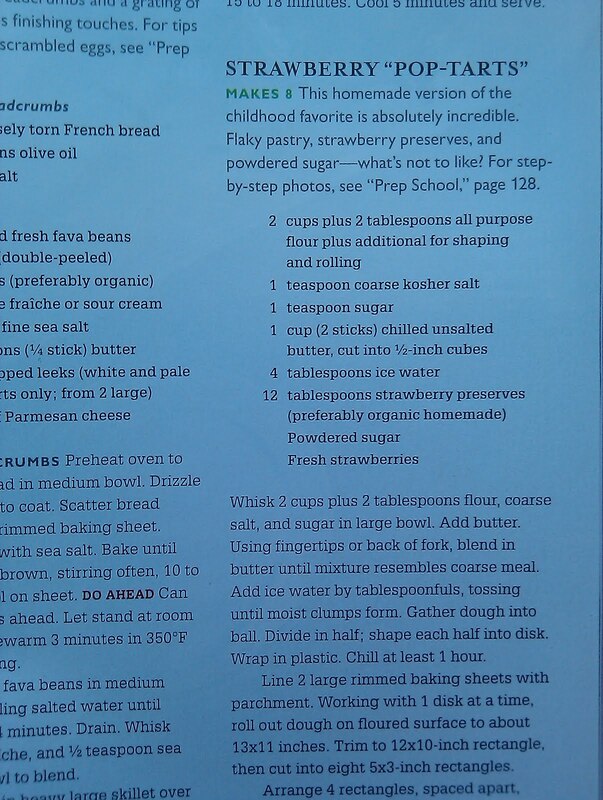 I believe it's a parent's job to educate their children to be mindful eaters, cooks, and bakers. It's EVERY ADULT'S job to be the same. When it comes to nutrition and health, the responsibility rests with individuals. Educate yourself! Read about what you're putting into your mouth. Wouldn't you rather pay the farmer now than the doctor later? Kathy – Yes, I'm like a recent "convert" with loud opinions! Great analogy! I haven't had a pop-tart in years. I agree with you – who just eats one from the package?! I linked this as part of my Friday Five over at Kate's Library. "In regards to my long suffering husband (also see my earlier comment), have you heard of "banter?" My husband and I exchange something called "banter" frequently. It livens up things quite a bit. Humor is an important ingredient in a marriage…"
What a shame you choose to reply to your readers with rudeness and sarcasm. It's not the first such comment I've seen from you. I think I'm done with this blog. Anonymous – Please advise me on how I should have responded to those comments about my marriage. I agree with those who think your valid points get lost with your statements about "corporate irresponsibility." Do you think your local butcher down the street should be shut down for selling that delicious summer sausage you ate the other day? They don't make Poptarts in Australia anymore. Anything we get here had to be imported and they only sell them in Candy shops. They used to be in supermarkets here and I vaguely remember them being placed near food like waffles, packaged pancakes and crumpets. I was allowed to have them as a kid, not as a breakfast food but as an occasional after school snack which I had to share with my brother (they came in packets of two). I am with those who think it is weird (and very immature) to "ban" your husband from buying something. I am married and the second I started that, he'd mention that he doesn't tell me what I can and can't do and it works vice versa. So unless your husband quits work and isn't providing at all to the household income, then he is perfectly allowed to spend his money on whatever he wishes – even if he wanted to buy a dozen donuts and eat them right then. Again people, it is so more important to teach children things in moderation than say "no, this is junk good – never ever eat it because it is evil" which seems to be the tactic a lot of posters here are taking. You are only encouraging the same children when they grow up to wind up eating more of the things they weren't allowed as children instead of learning how to make a good decision. You do realize they will find out about these foods you are pretending they don't know anything about at least by the time they hit middle school and definitely for sure by high school. One poptart (or donut or whatever) is okay in moderation as long as the majority of the time you are making the correct decisions. 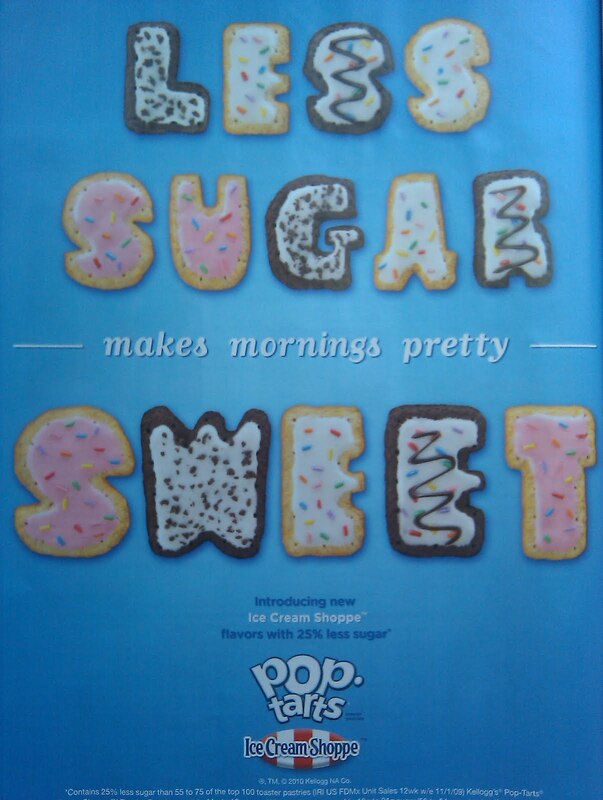 The last time I ate a pop tart (they were in the vending machine at work), I felt ill afterward. Queasy and headachy. I don't know which ingredient did it, probably all the sugar. I used to eat them all the time as a kid, though. My family loves junk/processed/fast/convenience foods. I'm the rebel who grew up and tried to learn to eat healthy…a work in progress, actually. But pop tarts are forever banished from my diet. I am loving these ad posts! Another one you should consider is the new Chef Boyardee commercials. Advocating not telling children that they're eating veggies, making a big deal out of not letting them know that the raviolis they eat are healthy. I mean, I understand that vegetables can be a fight to get kids to eat… but shouldn't we be taking more of a Hidden Valley Ranch stance on the issue (I love those commercials)? We should be advocating that vegetables are good and yummy and can be fun, not putting mothers in time out for having the "audacity" of telling kids they are actually eating healthy? It bothers me everytime I see those ads.. I apologize for the new comment in a two year old blog entry. The latest series of entries have made me question exactly what I can eat these days. If it isn’t full of sugar or sugary products (looking at you, HFCS), it has far too many carbs. If not that, it has possibly been exposed to drug resistant bacteria. If not that, elements of it have been harvested through environmentally destructive practices, etc. I haven’t seen beef in my local supermarkets that has grass fed on the label. Though I appreciate what you are doing and will continue reading through the rest of the blog, in a way I wish I hadn’t found it (please don’t take that in the wrong way!). great post. but one question why bash gelatin? ya it comes from an animal(unless it is a vegetarian gelatin) i agree that our country needs to get to the bottom of what is good for us and what is bad. i have a hypothesis. plant based anything is bad. THBQ? is petroleum based guess where petroleum comes from. red 40 you guessed it petroleum. yellow 6 you guessed it petroleum, etc, etc you get my point. these plant based foods are toxic. wheat and grains aren’t meant for consumption thats what we feed our herbivorous animals. because herbivores eat plant and carnivores eat meat(which come from the herbivores or other carnivores. and the whole red meat is bad for you cause saturated fat was a ploy from the wheat and grain companies which seem to make up most of the modern american heart disease and cancer laden diet. i believe that we are carnivores not carb and sugar eating herbivores(all carbs and sugars come from plants). there are only 2 digestive tracts herbivorous and carnivorous, there is not such thing as an ominvore thats impossible in my opinion. humans thrive on cholesterol not plant sterols. and that cholesterol is found in meat and the body turns saturated fat in meat into cholesterol. which our bodies us to absord vitamin d3(cholecalciferol). cholesterol competes with plant sterols in the digestive tract this is why when you eat plant sterols(i.e. margarine) you lower cholesterol which your body needs and thrives on(because your a carnivore) just like a tiger and many other animals thrive on cholesterol because they have a body and disgestive tract that thrives on cholesterol. when you lower your cholesterol from plant sterols you develop diseases like high blood pressure, cancer, diseases . etc etc. When you take theses plant sterols witch are found in vegetable oils and even grains etc you are lowering your cholesterol(witch is very important to the human body) and are increasing plaque in your body because you arent meant to consume. thats what it turns to which plaque turns to high blood pressure, cancer, heart disease, other diseases etc. our brains our made up of cholesterol. and saturated fat is good for the heart and brain. and for all those people that think were vegatarians and vegans, question- how would we make testosterone if we didn’t eat meat huh? steroids are made from cholesterol. and there are also plant based steroids witch and given to herbivorous animals like a through bred race horse. it is thought that steroids cause heart disease because ignorant people think humans are vegetarians. if you take a plant steroid you;ll die, cholesterol steroid you’ll thrive. doctors give infants steroids who are failing to thrive. i know we are meant eaters because we have a thyroid just like a tiger does and they thrive on vit D. and you need cholesterol in order to absord vit.D plants don’t have a thyroid. what im saying is we have things in common with carnivores like a thyroid, we breathe oxygen and exhail carbon dioxide, plants do the opposite they inhale carbon dioxide and exhale oxygen. do i have to spell it out any more obviously.